megacephala-group - major - head width and length equal or subequal; mandibles relatively slender, with at most reduced teeth or denticles; postpetiole trapezoidal but without elongated lateral prominences. Minors without or variable development of a nuchal collar. 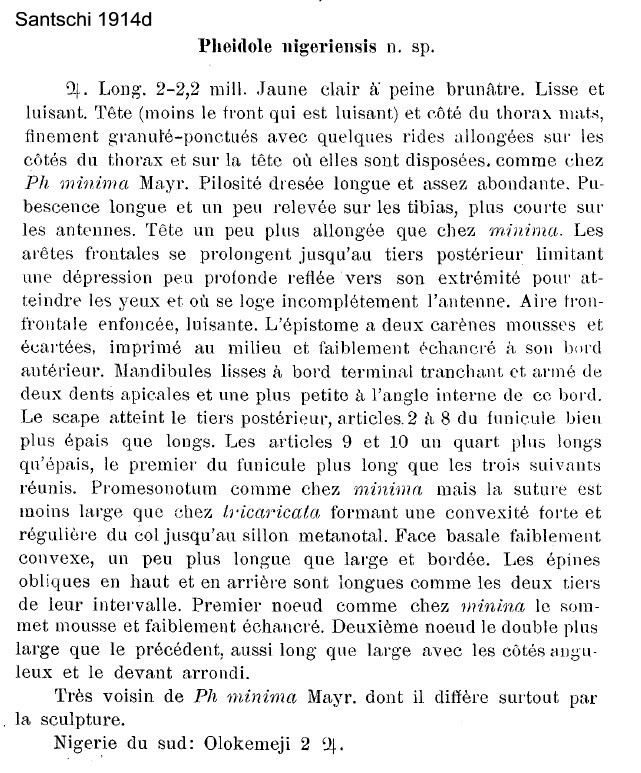 Type location Nigeria (Pheidole nigeriensis n.sp., Santschi, 1914d: 340, major) collected at Olokemeji by F. Silvestri - no images on Antweb (November 2014); major only described (see Bolton, 1995) . Note: If my identifications are correct this may well be the senior synonym of Pheidole minuscula. Colour dark red-brown. Sculpturation slight, faint spiculation on the lateral mesonotum and propodeum. Erect hairs are moderately abundant, and are relatively long and fine. In profile, the petiole node of the major is relatively high and emarginate; the post petiole node is relatively short with a rounded profile and is produced laterally to give rounded triangular prominences. The propodeal teeth are small acute and triangular. The minor has a petiole which is short with a raised node but is not produced laterally. 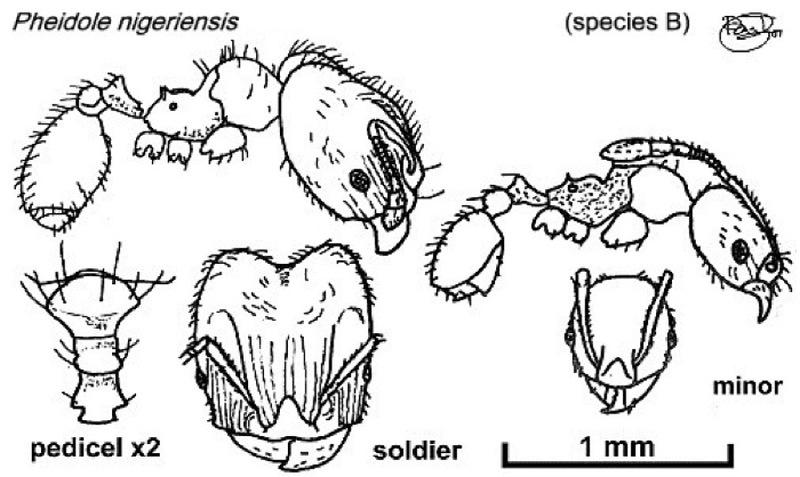 From the description of Pheidole minima ssp malelana given by Wheeler (1922) this must also be very close to that form. In Nigeria it nests in crevices or rot holes on living trees. Forages on the ground and on native trees. Fairly common on cocoa, on 1.0% of trees, throughout the cocoa growing area; nesting in soil and debris in crevices and building debris tents over Homoptera of all main types. Also found on cashew, oil palm and plantain (Taylor, 1977; Taylor & Adedoyin, 1978). Also reported from the Mamfe-Mampong cocoa farm in Ghana by Room (1971), but he collected it only in or cocoa leaf litter, and it played no part in his report of the ant mosaic. Found on cocoa at Kade by Majer (1975). See specimens below and on the linked majors and minors pages. There is some variation in colour from light to dark brown with location. The majors have a distinctive conbination of long frontal carinae and quite short scapes. The photomontage is of a major from Cameroun; Awae II; 03�’30”N 11�’58”E; highland area elevation >500m; Tuna bait in forest; 9.v.2007 (fk pheidole sp3); coll. A Fotso Kuate. MAJOR: TL < 3 mm. Head, excluding the mandibles, as broad as long, near square, considerably broader behind than in front, and with the occipital border deeply and arcuately excised. Behind the eyes the sides are convex but in front feebly concave. Eyes small, moderately convex, situated just in front of the anterior third of the head. In profile the head is relatively slender, most convex in the middle dorsally but almost flat ventrally, narrowing posteriorly but not depressed in the occipital region. Mandibles large, smooth and convex, with very low basal tooth, smooth dark margin and two low blunt teeth at the apex. Clypeus flat, smooth, anterior border with a distinct median notch. Frontal area large, subtriangular, without a median carinula; frontal carinae long, diverging, continued back as delicate rugae bordering a distinct shallow scrobe. Antennae slender, scapes terete, curved at the base, reaching to just past the middle of the face; funiculus segment 2 longer than broad, 3-8 square, club equal or longer than remainder of the funiculus, each segment with convex sides, apex sharply tapered. Gula with a pair of prominent, sharp (hypostomal) teeth. Thorax short and robust, shorter than the head without the mandibles. Pronotum with distinct and moderately acute humeral tubercles, mesonotum sloping to a deep metanotal constriction, with a shallow transverse welt; propodeum broader than long, dorsum raised behind metanotal groove and sloping in the middle; spines blunt, somewhat shorter than the base, a little longer than their interval, directed upward and slightly outward. Petiole quite large, narrow, fully twice as long as broad, seen from above with the immediate anterior flared and wider than node with subparallel sides, the node fairly long and high, with acute transverse superior border, distinctly notched in the middle. Postpetiole three times as broad as the petiole, subtriangular, broader than long and broader behind than in front, with rounded sides, in profile near square its ventral surface without a tooth, its dorsal surface flattened. Gaster quite narrowly elliptical, smaller than the head. Legs quite stout, femora thickened in the middle. Shining; mandibles smooth. Head longitudinally rugose, the rugae fine and quite dense, the interrugal spaces with very fine spiculation, distinct scrobe. The rugae on the front straight stoping at end of scrobes (2/3 length of face). Sides of head smooth and shiny. Occipital lobes with quite numerous but small hairs pits. Pronotum shiny but weaklytransversely rugulose. Gaster wholly shiny. Overall yellowish-brown, darkest on pronotal dorsum and posterior gaster; funiculi and legs paler. The base colour appears to vary from nest to nest or perhaps even within a nest from quite dark brown to golden yellow. Erect hairs yellow, fine abundant on gaster and posterior head. MINOR: Short and stocky overall, darker than soldier, legs and funiculi golden-yellow; shiny except densely spiculate lateral alitrunk and propodeum; head in full-face very relatively square, eyes fairly flat, fine nuchal collar; propodeal spines very short and blunt.